Education Costs > How Much Does CDL Training Cost? Training for a CDL needs to be taken by individuals who would like to obtain a CDL. The training program specializes in teaching potential truck drivers the necessary skills and knowledge to properly operate a truck. There are many different companies that offer the training programs nationwide, and the length of these training classes can range anywhere from four to 10 weeks. The price for CDL training depends largely on the school that is offering the class, if you’re being sponsored, the geographical area and if any financial aid and/or scholarships are involved. On average, the price for CDL training can average anywhere from $2,000 to $6,500 for the entire course. Your private schools that are not associated with any trucking company will often cost about $3,000 to $6,000 and will take about eight weeks to complete the program. Your company-sponsored schools, on the other hand, will be free; however, you will have to sign a contract with the company in order to get your tuition paid for. If you were to quit before your contract, you would be responsible for the tuition. Trucking companies that offer CDL training include Swift transportation, Stevens Transport and Schneider National. For instance, with Swift, their training will cost $3,900, but you will be reimbursed the total costs as long as you work with them for 26 months. Some schools, according to our research, may even charge on a “per lesson” basis. For example, CDL College charges $250 for one lesson or $1,500 for the entire local Class A or B course. Trucking Truth notes that most independent trucking schools will cost about $3,000 to $7,000. We researched a few popular CDL training schools and included the price average in our table below. Schneider $4,500, but will be reimbursed after 24 months of employment. Stevens Transport $5,995, but company can deduct payment from paycheck, depending on credit score. Swift $3,900 but will reimburse 100% after 26 months of employment. There are three types of licenses available: class A, B and C. If you were to take a class A training course, you would pay much more than a B or C course. There are two common types of schools: the independent schools and corporate schools that are run by the trucking companies. Just like a college, the costs will depend on which institution you choose. The payment for CDL training includes the entire length of the course until it is finished. The use of the vehicles, as well as the instructors, will be included in the payment, and the average course shouldn’t take any more than four to six weeks on average. Schools will teach you state and federal regulations and offer hands-on experience to help you become comfortable behind the wheel. Upon graduating, you should know about the long haul, short haul, local operations, the basics for over-the-road travel, rules, regulations and being prepared for the CDL test. Upon completion of the class, the student can successfully apply for a CDL license at the local DMV, but before a CDL license is given, most states are going to require that a written test and road test is taken to ensure that all rules and regulations are followed. An additional cost for CDL training includes the registration fee that you will need to pay when you sign up for the training program. The price for the registration fee depends on the company and will usually range anywhere from $100 to $150. Some schools may charge an additional fee for books, uniforms, and medical tests. Special endorsements can cost extra if not included with the tuition. Upon successful completion of the program, a license will be needed through your state. State by state fees will vary. See: “How much does a CDL license cost?” Additional endorsements may be required in addition to the CDL license. This will depend on the company policy. If attending a school that’s away from home, you may have to stay at a nearby hotel while completing your program. To get your CDL, you will first need to pass a DOT physical. Next, you will need to study for your CDL permit, the test you will take at your local DMV. Once you have your permit, you will attend the schooling and will need to pass your CDL skills test. Before choosing any school, do a quick search online to see what kind of reputation they have. What are the other students saying? Be sure to look at both the good and the bad. See how much driving time you will get with your training program. All schools will vary and the best way to learn is by actually driving the truck. To save money, try to look for a company that will provide the training at a lower cost or even free. If you’re able to find this type of offer, keep in mind these companies may force you to sign a contract before this training is provided. If the new hire does not live up to the contract, the training will have to be paid back. Consider checking with your local community college as most are going to offer these classes for the best rate. Check with the local school to see if there are any type of financial aid programs available or special funding. 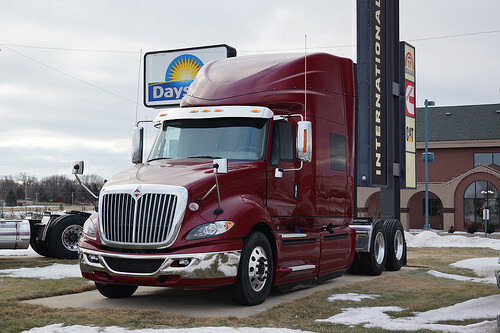 For example, some trucking schools will accept many of the GI Bill programs. Like college, you don’t need to pay your tuition up front. Consider signing up for a student loan to help make budgeting easier for the month. Chances are there are a few independent trucking schools in your area. Just like comparing colleges, visit at least three to five websites and/or campuses and see what they can offer for you and what they charge. Don’t focus solely on the money, however. Pay close attention to their job placement program, their educational materials and the experience of the teachers.